إن فندق منتجع وسبا سيرفرز بارادايس ماريوت بموقعه الممتاز في هذه المنطقة السياحية هو نقطة انطلاق جيدة لنزهاتك في هذه المدينة المذهلة. يقع الفندق على بعد 0.1 km من مركز المدينة، ويؤمن الوصول إلى أهم مراكز المدينة. سوف يعشق النزلاء موقع هذا الفندق، فهو قريب من أهم المعالم السياحية في المدينة . إن الخدمات الممتازة وحسن الضيافة العالي في منتجع وسبا سيرفرز بارادايس ماريوت تجعل إقامتك تجربة لا تنسى. هذه بعض الخدمات الموجودة في هذا الفندق: واي فاي مجاني في جميع الغرف, خدمة غرف 24 ساعة, أمن على مدار 24 ساعة, خدمة التنظيف يوميًا, خدمة غسيل ذاتية. في الفندق غرف نوم يتجاوز عددها 304، كلها مجهزة بعناية وجمال وبعضها مزود بـ مروحة, سياسة التدخين - غرف لغير المدخنين متاحة, مكيف هواء, شرفة/ تراس, ساعة منبه. صممت خدمات الاستجمام في الفندق والتي تتضمن الغوص السطحي, جاكوزي, شاطئ خاص, مركز للياقة البدنية, ساونا لمساعدتك على الاسترخاء والراحة. إن منتجع وسبا سيرفرز بارادايس ماريوت هو مكان مثالي للمسافرين الذين يتطلعون إلى الراحة والاستجمام في المدينة. تتوفر خدمة صف السيارات وتخضع لرسم إضافي بقيمة 30 دولار أسترالي. The hotel is decorated beautifully for christmas. the lagoon pool is superb, my son had fun looking at the fishes there. The room is excellent and clean. The bed is comfortable and we love the chocolates they gave on turn down service. Would love to go back when we visited Goldcoast again. The location is also convenient nearby the tram station. It was so nice to stay here. We have no regrets to choose Marriott even we pay more. It located is Sufers Paradise which is the centre in Gold Coast. Rooms are very nice and big enough. The pool is also fine and relaxing. Staffs are nice and always with smile. Breakfast is fine, many choices and delicous. A real 5-star resort! Must try. swimming pool is best!! you can swim, play with sand and snorkel..
nice and comfy hotel room, friendly and helpful staff, wonderful swimming pool (you can swim, play with sand and snorkel), close to convenient store, red rooster (fast food resto) and bus stop.. great choice for holiday.. The pool and resort facilities are just amazing, way more than what I expected. Staff was lovely, room was cozy and comfortable. However we were disappointed to have only one toothbrush in a room intended for two people, also usually when I stay in higher end accomodation the room is absolutely immaculate, this time overall cleanliness was good but a few details here and there like a bit of sand left over in the tub and smudges on the mirror where a bit dissapointing considering the price paid for our room. Same for water, at every resort I’ve stayed in so far there was a complementary water bottle in the room, here there was just a 7$ Fidji water bottle available. I don’t know, that just felt like they’re just plain money hungry at this stage. It’s a bit unfortunate. We hadn’t returned to the Marriott in over 14 years and nothing had changed only the costs for accomodation and food and wine. The pools did not disappoint finding them all very clean and refreshing. Stayed here for 3 nights during August with our 2 year old. This is a lovely hotel, great relaxed tropical vibe. Room was a standard double and beautiful, very comfortable & loved the bathroom - handled our toddler well. The large wardrobe was also good for hiding away the mess. Used room service and that was great too. The beach pool was beautiful and nice to sit around and for pictures, a bit too cold for me to swim in but my 2 year old thought it was great. 2 hot pools were a better temperature, even the heated lagoon pool was not heated enough for my liking in August. Breakfast buffet was wonderful and so was Citrique on the one night we dined al a carte - very much liked the service and the atmosphere. About a 10 - 15 minute walk into the centre of Surfers, but it feels very secluded out in the hotel - in a good way - we had a hard time leaving the serenity. Spent 2 nights with my partner and 6mo child. We had a great time at the poolside with snorkeling in the 'beach' with fish. Was great since my 6mo is a little scared of the giant waves down at the real beach. I had the Seafood buffet which was just to die for, where as my vegetarian wife was not willing to fork up the price for such a meaty buffet and was stuck with 1 option on the menu. The only down side for us which was quite dissapointing, was that they had a function on that Saturday (I believe it was an engagement party or wedding) which had a live band and took up the pool from 7 -1030/11pm. Trying to put our bubs to sleep was near impossible (and we were on the 22nd floor) it was just too loud and no one told up that there was going to be a function on. So we were unlucky that there was a function on apart from that a perfect experience! I stay regularly with the girlfriends for a weekend short break and always get a beautiful room with fantastic views. The Resort is always clean and the staff are friendly. We got a good deal this time but in most cases I find the cost too high to stay even more regularly. Fantastic hotel. Another great stay, we love this hotel! Buffet breakie is always great and lots of choice. The pool area is great with two different pools to choose from and even uncover areas which are good when raining! In school hols they also have activities some of which are free. Would definitely recommend this hotel is traveling with kids, it's a true resort and you don't even have to leave the grounds for dinner as several restaurants choices. Staff very helpful on check-in to find a great room. Was a last minute decision to stay. Booking was done via Agoda, but payment wasn't verified on arrival (15 minutes after booking). Staff took this under control and checked us in while chasing up later with Agoda to verify payment. The only problem I have with this hotel is that it is a long walk from the beach or the main strip at Surfers Paradise. Booked a weekend getaway with friends as a surprise birthday present and was really awed by the excellent service provided by staff, the room decor, large room sizes and entertainment at the teppanyaki restaurant. Will definitely be coming back to stay this this year :)). Only bad thing was there's a lot of construction going on,on the roads in front of the hotel when I was there. made it a little hard to get to the hotel because we had to do u turns to be able to turn into the underground parking. 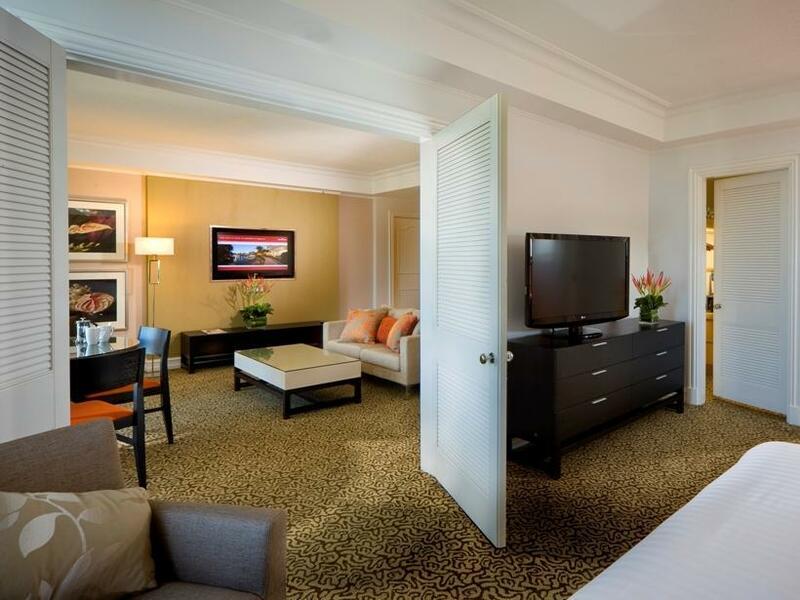 Great luxury, comfortable rooms and great pools. it was our second time in this hotel. we enjoyed the relaxing days at the pool and the great service the staff provided. we do think that the buffet does not offer a lot for vegetarians (even pastas or curries have meat or fish in them and that is not necessary). we do question some of the pornstar-like clientele (tattoos in face, lots of plastic). 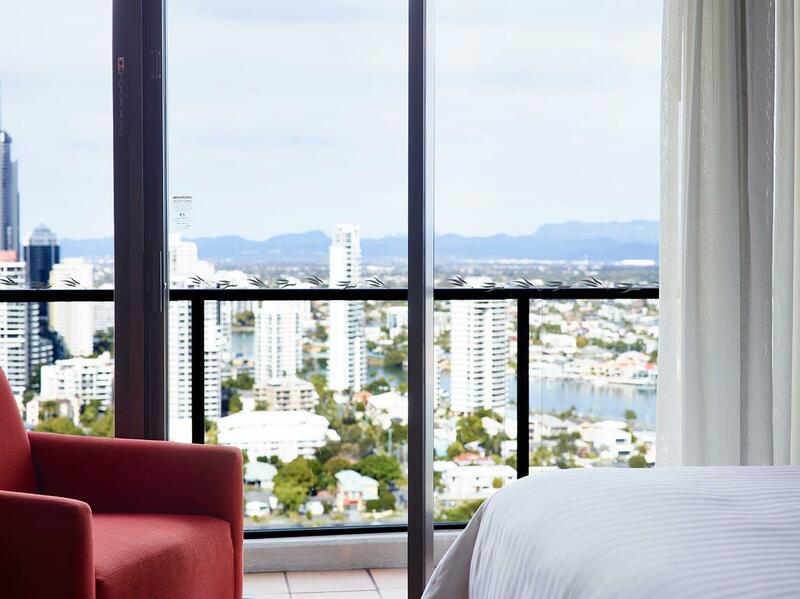 Our stay at the Marriott was perfect, it rained in Surfers Paradise continuously and this gave us the opportunity to just lay around on a very comfortable bed and room and enjoy each others company, over all it was a good hotel and room! Great breakfast and salt water pool with fish! great stay over xmas, even though busy the hotel was spotless and the buffet breakfast was great and fresh. the pool is great, especially the salt water pool with a little beach, much safer than the gold coast beach for littlies. they also had games for the kids to play. i would definitely recommend this as a family hotel, also close to theme parks. Had wonderful time, very relaxing, did dining at the restaurants, very comfortable stay, a lot of fun at the sea water lagoon for the kids, it has salt water fish that the kids enjoyed looking at, snorkelling is available which is great. This was everything we expected. The staff were amazing and the rooms just spectacular. 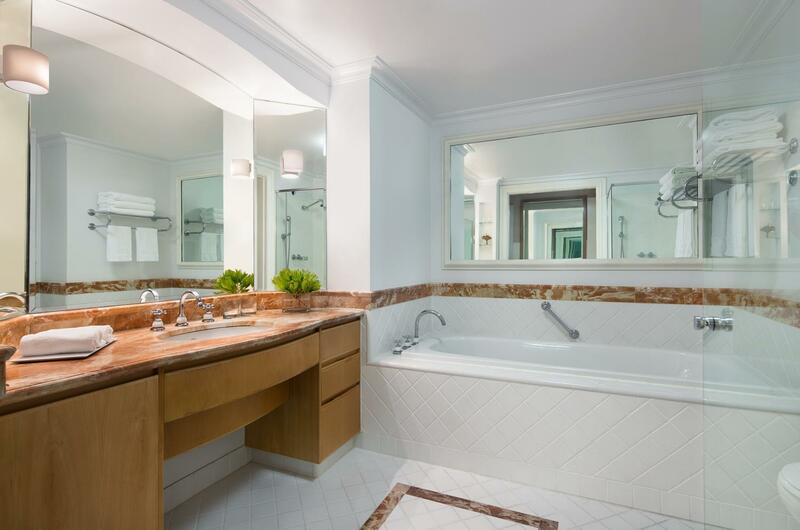 Only one criticism and that is the bathroom tiles were painted rather than replaced during the renovation. The paint is peeling in many places. The best thing about this hotel is the lagoon. 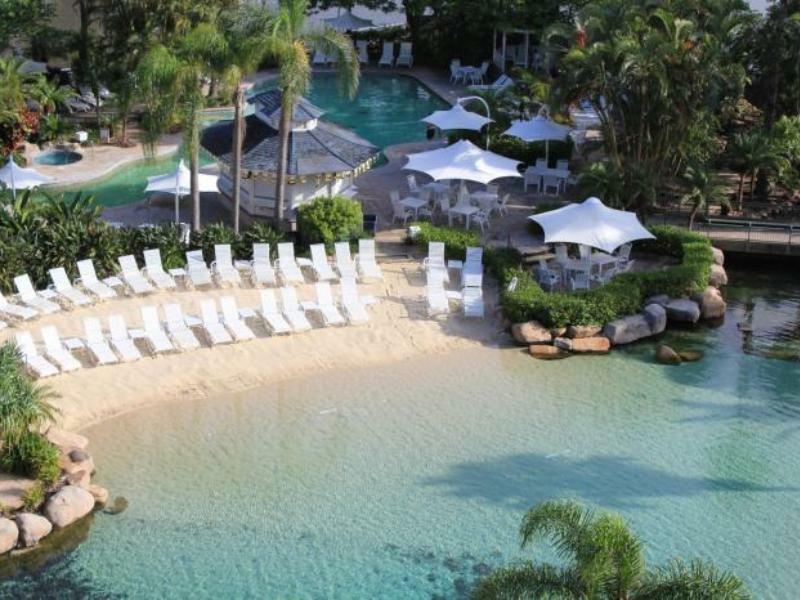 The hotel has two man made beaches with a salt water lagoon, which is a great alternative to the beach. There's also a great pool with spa and watersides. The hotel has great restaurants and good sized rooms. The service at this hotel was very good. 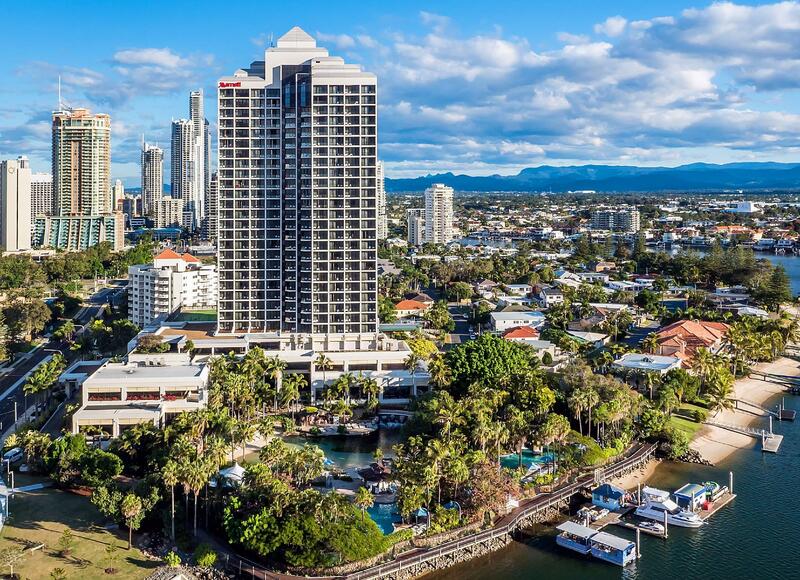 The only slight downside is that it is a little far from the centre of surfers paradise, which could be a good thing if you prefer a more quiet area.